MUNICH, Germany â€“ South Korean teenager Amy Yang shot a 5-under 67 on Sunday to win the Ladies German Open by four strokes. Yang, an 18-year-old who had a course-record 63 on Saturday, finished with a 21-under 267 total for her first victory as a professional. Swedenâ€™s Louise Stahle was second at 17 under, and Gwladys Nocera of France was another stroke back in third. This isn’t even Yang’s first win in a professional golf tournament. In 2006 she won the ANZ Ladies Masters in Australia. An event considered a major championship by the golfers from down under. 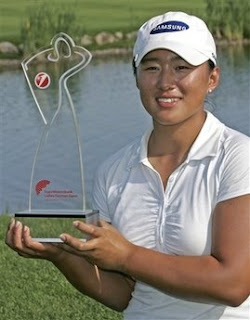 Yang is also the leading money winner on the LET(Ladies European Tour) so far for 2008. Next week is the LPGA Championship at Bulle Rock. Yang, who only has non-exempt status on the LPGA Tour, would be a good long shot pick for the LPGA. At present Amy looks unlikely to be in the field. Wie shot 67 to finish 14 under, the first time since the Evian Masters in July 2006 that she completed a tournament under par â€“ a streak of 13 events that included seven missed cuts. Michelle Wie shot 4 straight rounds under par, by far the best golf she has played in two years. So is Michelle back? I’d wait to see how she plays at the Wegman’s in three weeks before passing judgment. Michelle was given a sponsor’s exemption to play in the Rochester New York LPGA Tour stop.